Politicians and industry have long boasted of the ability for an expanded Trans Mountain pipeline to get oil to lucrative Asian markets from Burnaby’s Westridge terminal. But experts in Washington State are increasingly concerned that the twinning of the Edmonton-to-Burnaby pipeline may in fact lead to an expansion of the Puget Sound Pipeline, a 111-kilometre “spur line” from Trans Mountain that branches southward at Abbotsford to carry oil to four large refineries in the Puget Sound region. If Kinder Morgan shareholders vote to approve the deal, Canada will purchase the Puget Sound Pipeline as part of the $4.5 billion deal for the existing Trans Mountain line — meaning the decision to expand the spur line would eventually fall to Ottawa. Most of the oil transported on the existing Trans Mountain pipeline already ends up going to refineries in Washington — either by pipeline or tanker. According to data from the National Energy Board, an average of 295,600 barrels of oil per day was transported on the Trans Mountain pipeline in March 2018, the most recent month of reporting. About 62 per cent of the oil went to Washington State via the Puget Sound Pipeline. Because I know where most of the tar sands gunk already goes to, I have been saying that the Liberals are going to announce before the next election that they are not going to ship out of Burrard Inlet. If there was a ready Asian market that would give Alberta a better price they would already be tapping into it. There isn't but the Enron boys Kinder and Morgan have walked away with a ton of free cash for a well played long con. I can imagine the conversations about potential NAFTA challenges that preceded the over priced purchase by the public purse. ..yes it was understood for a while that the dilbit was going to the states and there were no asian markets out of bby. what is new, at least to me, was that the majority of what is coming from alta is running through the puget sound pipeline to washington. not through bby and not by rail (which was a concern). ..this makes abbotsford, where the pipeline branches south, important. which makes the struggles before abbotsford that much more important if the goal is to stop km. I stopped and visited these warriors on my trip to the Interior at the beginning of the month. I read Unsettling Canada by George Manuel earlier and one of the people living in a Tiny House at the proposed site of the Trans Mountain construction camp is his daughter. Ten tiny houses will be built and placed strategically along the 518 km TransMountain pipeline route to assert Secwepemc Law and jurisdiction and block access to this pipeline. This is one of the most serious threats to our Territories.We have never provided and will never provide our collective free, prior and informed consent - the minimal international standard - to the Kinder Morgan Trans Mountain Pipeline Project. Investors take note, the Kinder Morgan project and any other corporate colonial project that seeks to go through and destroy our 180,000 square km of unceded territory will be refused passage through our territory. We stand resolutely together against any and all threats to our lands, the wildlife and the waterways. We, the Secwepemc, have never ceded, surrendered, or given up our sovereign title and rights over the land, waters and resources within Secwepemcul’ecw. We have lived on our land since time immemorial and have never been conquered by war. We collectively hold title and governance regarding Secwepemcul’ecw and the collective consent of the Secwepemc is required for any access to our lands, waters and resources. Trucks were lined up outside Kinder Morgan’s oil tanker terminal construction site in Burnaby this morning as five people blocked the gates. Doctors who helped organize the event spoke to the crowd of supporters about the dangers of an explosion or spill from the tank farm, as well as the indirect risks of building new fossil fuel infrastructure. Smoke from BC’s 600 wildfires shrouded Kira McLean (24), Jim Fidler (68), Brenda Morrice (57), Cynthia Nugent (64), and David Gooderham (73) as they were arrested, a stark reminder of the extended health impacts associated with climate change in the province. ..yes and i believe governments and police have a special hate on for kanahus manuel and the secwepemc nation. this special hatred extends to the unist'ot'en camp who are blocking lng pipelines. both these groups have, in the past, interupted meetings meant to bypass indigenous nations as a whole. in at least 3 of the interruptions i have posted here the government bureaucrats quickly scurry away not wanting the attention of why they are there in the first place. And let us not forget Gustafsen Lake, where the truth of Secwepemc sovereignty was made quite clear in 1995, despite its suppression by the crooked usurpers in Victoria and Ottawa. ..yes gustafsen lake as well. a huge black mark and shame on the ndp. ..great letter. read it all if you can. As one of the three founders of the Canadian Association of Physicians for the Environment, I have a keen interest in preventing environmental degradation, because I know that human health —my over-riding professional focus — is entirely dependent on healthy ecosystems. 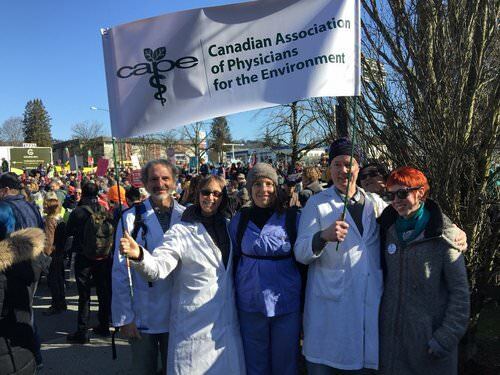 As a physician, I have not personally been arrested on Burnaby Mountain – yet – for protesting the expansion of the Kinder Morgan Trans Mountain pipeline expansion. But I understand why over 200 other people have since March, and why some doctors were risking arrest this morning while protesting the Kinder Morgan oil pipeline and tanker expansion. As this province, once again, struggles under the burden of hundreds of forest fires and other extreme weather events closely linked to the advancing effects of human-caused climate change, the impetus to engage in civil disobedience grows stronger. You have, to date, convicted every individual presenting to his court charged with Criminal Contempt of Court (an offence that, despite its name, does not create a criminal record) if corroborative evidence from the RCMP is available and presented by lawyers for the Crown. The penalties for conviction, drawing on precedents established during the legal system’s response to Clayoquot Sound protests in 1993 and subsequent situations, have been steadily escalating. These now include heavy fines, extensive community hours, and increasing jail terms. Last week, you sentenced seven women, six of whom were in their late sixties and mid-seventies, to serve time in prison. You have, so far, largely dismissed eloquent statements from scientists, health professionals, well-informed seniors and others — many of whom have never before before resorted to civil disobedience — as irrelevant. Crown lawyers continue to fall back on the narrowest of interpretations of the relevant law, while provincial and federal governments by and large sit passively aside, paralyzed by vested interests. Your role, as I understand it, at least in part, is that of “trier of fact.” I, by contrast, am a primary care physician in a small B.C. town. I see people based on no other criterion than that they are suffering or distressed in some fashion – by illness, injury or simply worry. In my practice, I work to address the whole person, and hence I must inevitably address the world they live in, because the their surroundings may play a role in their suffering or ill health. Your decisions around the protesters could be interpreted as willfully blind to an essential reality of our time. But you've seen this kind of situation before. In 2005, as a lawyer, you argued on behalf of Imperial Tobacco that public officials should not be allowed to ask for reparation from the tobacco industry for injury caused by its products. You argued this case all the way to the Supreme Court of Canada, only to see that public officials, in a changed world, were granted the right to seek such reparation. Two Indigenous Elders were arrested at Kinder Morgan’s oil tanker terminal this morning, after blocking access to the construction site for more than two hours. Under smoky skies, Indigenous leader Chief Judy Wilson detailed the numerous violations to Indigenous Title and Rights by Kinder Morgan's pipeline and tanker project, including recent news that the company intends to put controversial salmon-spawning deterrents down in 26 BC waterways. “I came here today to support those taking action at the tank farm, and am also aware that the action will be moving east, and I will be there too. Our people will never give up no matter who owns this pipeline,” said Chief Judy Wilson, elected chief of the Neskonlith Band, one of 17 communities of the Secwépemc Nation, and Secretary Treasurer of the Union of BC Indian Chiefs (UBCIC). The United Nations Declaration on the Rights of Indigenous People (UNDRIP) includes provisions that state Indigenous peoples must have free, prior, and informed consent concerning projects that impact their territories. The Canadian government adopted UNDRIP earlier this year before announcing their purchase of the Kinder Morgan pipeline, despite a lack of consent from many Nations along the route. Federal Liberal Fundraiser: Shut Down! UPDATE: They have cancclled the fundraiser and we're meeting to celebrate! Same details as before. Congrats everybody! Fundraising while 600 wildfires burn and climate chaos intensifies while pushing a climate-busting pipeline -- the priorities of Justin Trudeau's federal Liberals are clear. Thursday August 23 in downtown Vancouver, Liberal MP Hedy Fry is hosting Finance Minister Bill Morneau for a $500 a plate fundraising dinner at a fancy hotel in downtown Vancouver. Nanaimo will host an unwelcome party for Justin Trudeau and his cabinet on August 22, and there's a decent chance Trudeau will make the trip to raise cash for the 2019 election. Join us to remind MP Fry that the people of the West Coast do not accept the stubborn federal Liberal push to build a pipeline while wildfires burn and climate change chaos intensifies. ..the alta ndp on the job. aren't we all just so relieved! Alberta’s ruling New Democrats are reassuring the oil and gas industry that a revamped science curriculum won’t portray them negatively, even as they move to ensure students learn that climate change is real. Education Minister David Eggen and Energy Minister Margaret McCuaig-Boyd hosted representatives of energy companies and environmental groups at a round table Wednesday to get input on the government’s $64-million review of what children are taught in the province’s classrooms. Eggen told reporters the new curriculum will be evidence-based and include the best information available on how greenhouse gases are impacting the world’s weather. But he said it will also ensure students are not misinformed about and understand the merits of energy megaprojects like the proposed Kinder Morgan Trans Mountain expansion pipeline that would carry Alberta bitumen to the B.C. coast. "Federal government now paying the bills as work picks up in Alberta and BC." The shut-down of his catastrophic ecocidal disaster must be placed front and center in priority for anyone who cares about the land, waters and a future. Symbolics will not suffice. Stop this pipeline by any and all means possible. "I am here today to defend liberty and freedom and I am here to defend the rights of Coast Salish people and the residents of Burnaby to protest an egregious pipeline. The Canadian government has bought this leaky steel pipe from a corrupt Texas company with tax payers money. To defend its purchase the government has lied about the economics. There is no Asian price premium for bitumen and there never will be. Bitumen is junk crude and it is priced as cheap refinery feedstock around the world..."
We’re thrilled to announced that $100, 000 has been raised by communities from Washington state. The solidarity is incredible. We are all Salish Sea people. ..from an email. happening today. Tomorrow morning, verdicts from the cases against Kinder Morgan at the Federal Court of Appeal will be released. Watch for the livestream on our Facebook page at around 9:30 am PST. Last week, we partnered with Protect the Inlet to bring you the week of action to stop the Kinder Morgan buyout. Watch Chief Judy Wilson at Tuesday's event. Tomorrow we'll know the results of the legal challenges seeking to quash the NEB's approval of the project based on lack of consultation with affected Nations. Read our blog post about the possible outcomes. The decision will be released publicly at 7:30 am and the press conference starts at 9:30 am. First Nations land defenders and water protectors along the pipeline route are engaged in front line resistance to the project. In Secwepemc territory, which comprises more than half the total pipeline route, the Tiny House Warriors are building structures along the construction path. In Tsleil-Waututh, Squamish, and Musqueam territories, Coast Salish leaders built Kwekwecnewtxw – a traditional Watch House beside Kinder Morgan’s construction site to organize resistance to the pipeline and tanker project. Opposition to the Trans Mountain pipeline and tanker project includes the province of British Columbia, the state of Washington, the cities of Burnaby, Victoria, Vancouver and 19 other municipalities, more than 350,000 petition signers, and 25,000 Coast Protectors just like you who have vowed to do “whatever it takes” to stop the pipeline. Courage, friends. Whatever happens, our opposition is strong and powerful and we will stop this pipeline. This morning, Canada's Federal Court of Appeal overturned the Kinder Morgan TransMountain pipeline approval. This is a huge victory for Indigenous rights, for communities and for our planet. All I have to say today is thank you. To the Indigenous Peoples who have led this movement in since day one, to the countless organizers who helped to raise funds and support for these court cases and for the movement that has been relentless in shining a light on how broken Canada’s pipeline reviews are. Join us on the streets on September 8th to celebrate this decision - and push for continued accountability. Together we can stop every pipeline that gets proposed in the future. This outcome means that construction must stop, and that the National Energy Board review must be completely redone, with real consultation with Indigenous Peoples and considering the impact tankers in the Salish Sea. Whatever happens next, this means years of delays, and years without millions of barrels of tar sands flowing through the pipeline, good news for communities, the coast and our climate. Today we celebrate and thank everyone who helped make this possible, including you. And, today and every day we tell our government to get out of the oil business and get to work on building a 100% renewable energy economy that works for the many, not the few. We know that it’s not just possible, it’s already underway. We can see it in community and Indigenous owned solar energy projects like Lubicon Solar, in the cities, towns and entire provinces standing up to massive fossil fuel projects, and in the frontline opposition to dangerous pipelines like Kinder Morgan and Line 3. That’s why we’re not slowing down. On September 8th, hundreds of communities around the world will Rise for Climate and a 100% renewable energy future. Will you join them? Let’s make sure the Federal government listens to people in this pivotal moment, not the interests of Big Oil and billionaire CEO’s. Today's news was incredible. The Federal Court of Appeal said that consultation with affected Nations was not adequate and failing to assess tanker impacts on the Salish Sea was a fatal error. The approval of the Trans Mountain pipeline and tanker project has been quashed and all construction permits cancelled. We need to speak up and drown out the oil lobby in Trudeau's ears with our demands for justice. Today was a beautiful day, one I never thought we would see. But we can't stand down until we can be sure this head of the black snake is good and dead. The Prime Minister will be in Surrey on Tuesday September 4 and we'll be there to ask him to let the pipeline go. Join us at 6:00pm, RSVP now. Send your email now. Get ready for whatever happens next. We had a big win, but Trudeau and friends think their political legacy will be building this pipeline. "Minister Carr, together with CIIRD and the Israel Innovation Authority, announced a pilot program to facilitate new cyber security solutions for the energy sector. Calls for proposals are now open. 'To enhance the security and resiliency of Canadian energy infrastructure...this partnership will further Canada's and Israel's shared interests of greater energy security. We look forward to a remarkable collaboration with Canadian companies to help mitigate cyber threats in the energy sector both locally and globally." Apartheid state of Israel deepens its presence and influence over vital Canadian national infrastructure. 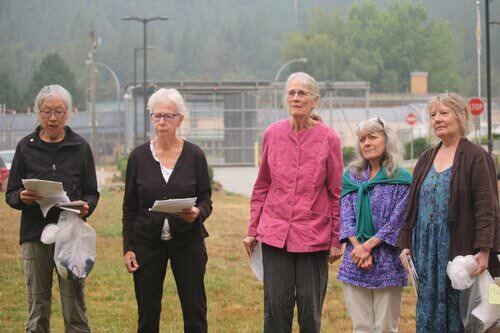 Several Protectors were released from a one-week jail sentence including (From left) Charlotte Gyoba, Susan Lambert former BC Teachers’ Federation president, Jean Swanson Order of Canada recipient, Heather Martin-McNab and Kathleen Flaherty.